Mitch Landrieu once predicted New Orleans would be underwater at the end of this century as a result of climate change. He was half right. The city was flooded last weekend but you can’t blame rising sea levels. No the blame lands squarely on the back of the incompetent Mitchell Joseph Landrieu. We now know the flooding the afternoon thunderstorm brought Saturday was made much worse as a result of a city government poorly run by its mayor. The clear culprit is a lame duck, hardly-ever-in-town, incompetent mayor, not the burning of fossil fuel. Mr. Landrieu was in Aspen, Colorado when all hell broke lose. He was there for a conference focusing on the foreign policy challenges facing the United States. What do you call it when a guy who can’t run his own city galavants off to solve the world’s problems? Being a Democrat. 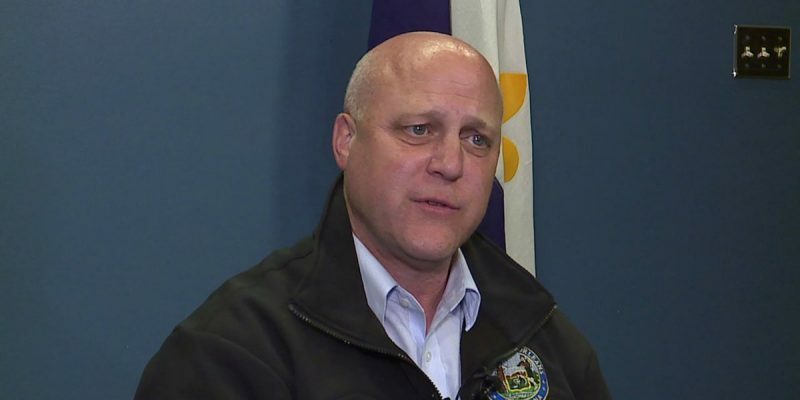 Mr. Landrieu can fire as many employees as he wants and scapegoat them all but it doesn’t change the fact that during Saturday’s rain event the pumping stations were operating at less than half capacity for the two neighborhoods hit hardest by the floods. How did Mr. Landrieu not know this? He’s the mayor. Unfortunately for Mr. Landrieu, when you ask people to trust you with their vote, ignorance of how the city you run functions, is not a viable excuse. While Mr. Landrieu was off in Colorado trying to solve the world’s problems his people were flat out lying about the pumping stations. Mr. Landrieu claims they lied to him too. But how could he not know the city’s pumping stations were in such bad shape? During Saturday’s flood, 14 pumps were not operating, two stations were working at half capacity and three turbines were out. Four of the pumping stations serving Lakeview were broken. How does the mayor not know so many pumping stations were broken? This is New Orleans, a city under sea level. Mr. Landrieu goes on and on about how we will all eventually be up to our waists after sea levels rise because of climate change and yet he has no clue the city he runs is grossly unprepared to even handle an afternoon thunderstorm. The storm began dumping water just after two in the afternoon Saturday and since there was nowhere for the water to go, streets and intersections quickly became impassable. But it was a full three hours until City Hall issued warnings about which city streets and intersections were impacted. You would think Mr. Landrieu would have immediately hopped on a plane Saturday leaving his hoity-toity friends in Aspen behind. He did not. He didn’t get back into town until Monday. Flood victims were forced to listen to a long parade of lies from Sewage and Water Board officials about the pumps and which ones were working. Originally we were told they were all up and running and working. Now we know that’s not even close to being true. The buck for this inability to tell the truth belongs to Mayor Landrieu. These are his people. His hires. He’s the guy in charge. During Tuesday’s city council meeting Mr. Landrieu called the misinformation “insulting to the public”. What’s insulting is how little Mr. Landrieu allegedly knew about how unprepared New Orleans is to handle a heavy rainfall. Mr. Landrieu promised his administration will study its flood response and will also have the issue reviewed by outside experts. Really? He’s been mayor for seven years. Is now the time to figure out whether the city is doing everything it can to prevent flooding? Mayor Landrieu hired his long-time loyalist friend and fellow incompetent Cedric Grant as director of Sewerage and Water Board three years ago. I suppose the two men never talked and that’s how Mr. Landrieu became so clueless regarding what bad shape the city’s pumping stations are in. Grant resigned this week, providing a perfect scapegoat for the Landrieu-friendly media to promote. You should have heard Clancy DuBos giving the mayor a pass on WWL-TV the day after the flood. His spin made Mr. Landrieu out as the victim in all of this. As far as Cedric Grant taking all the blame and losing his job I would wait before you shed a tear for him. His pension will pay him $175,000 a year for the rest of his life. That’s $175,000 a year while sitting on his couch watching Jerry Springer. But we’re told there’s no waste in government. It’s already been demonstrably proven Mr. Landrieu has no idea how to solve the crime problem in New Orleans and he has divided the city like no other mayor with his monument fiasco. Saturday’s thunderstorms taught us the mayor is also incompetent when it comes to dealing with flooding.